Standing water in your dishwasher even though it has finished the cleaning cycle? 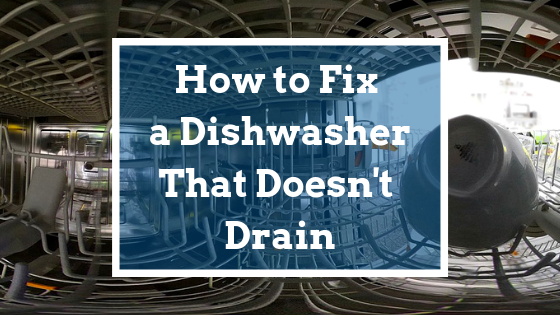 If your dishwasher is not draining, repair may not be as complicated or labor-intensive as you may fear. Dishwasher repair calls are a common plumbing service, but here are some ways to address the problem on your own. Remember that a small quantity of water at the bottom of your dishwasher is normal. It helps keep the seals moist. It could be that the flow of electricity to the dishwasher was disrupted and the cycle stopped before the cycle was complete. It never hurts to try running with system again. If the water clears at the end of this second run, your problem is solved. If your dishwasher door is unlatched, it won’t drain properly. If you have an older dishwasher, it may have worn components in the latch that causes it to slightly unlatch when running, possibly causing the cycle to end before it is fully complete. If for any reason the washing cycle was interrupted, use these buttons to cancel/drain the dishwasher. Refer to your manual or search for your dishwasher model online. In some cases, the cancel cycle and drain function is enabled by a combination of button pushes that must be performed in the right order. There is a filter at the bottom of the dishwasher usually toward the back. It sits over the pump that removes the water from the dishwasher. Dishes, bowls and utensils placed in the dishwasher should be well cleaned off. Food debris should be scraped into the trash, not thrown down the garbage disposal. You may have to unscrew a plate to get at the filter. Lift it out and clean it. Observe if there are food remnants or gunk down in the pump and remove it. If you have one, run your garbage disposal for at least 15 seconds with the faucet hot water running directly into it. Your dishwasher runs through your garbage disposal and any jam in your disposal can affect the washer. And while we’re on the subject of your garbage disposal, If this is a new dishwasher and you have this draining problem right away when using the unit, it may be that the drain plug in your garbage disposal was never removed. Because it is set deep in the drain hole, too often installers attach the rubber tube without removing the plug. This makes draining impossible. Just release the clamp holding the tube and pull it off, then check with a screwdriver for the presence of a plug and pop it out if it is in there. Replace the tube and tighten the clamp and the problem is solved. The dishwasher drain hose is at the bottom of the dishwasher, usually behind the kick plate. It is often a corrugated plastic tube that takes the drained water up from the bottom of the dishwasher, through the air gap device that sits up on your kitchen counter by the faucet (a shiny metal cylinder) and back down into and through your garbage disposal. First unplug the dishwasher and find the hose. Loosen the clamp that connects the hose to the dishwasher pump. Have a towel or sponge near you for any water that may spill. Clean out the end of the hose and then blow into it. If you meet with resistance and you can’t easily blow through it, unfasten the other end, under the sink and above the garbage disposal and clean it out in a sink. As with any plumbing element you inspect, check the hose for wear or kinks and if you find any, replace the entire hose. Even if you can unkink the hose, once damaged by a kink, it should be replaced as it will happen again. The dishwasher hose runs up a loop that peaks in what is called an air gap. This is that shiny metal cylinder we mentioned. The purpose of the air gap is to prevent dishwasher waste water from backflowing into the dishwasher. Unscrew the cylinder (counterclockwise) and check for gunk and if present, clean with water and a stiff brush. It may be possible that the wrong detergent was put in your dishwasher. Laundry soap or dish soap creates excess soap suds, preventing the system from draining properly. Slide out the bottom rack and bail out the water, then use paper towels to remove the rest. Run the dishwasher through a full cycle without soap and your problem may be solved. Did the plug come loose or was the outlet switch accidentally turned off? This switch is usually near the garbage disposal and most people place cleaning supplies beneath the kitchen skin. Something may have fallen over and moved the switch. Let’s face it, we take our dishwashers for granted – until something goes wrong. While a dishwasher is one of the most practical kitchen appliances, they do have a shelf life, and will need to be replaced about every eight to ten years. To keep a dishwasher performing as it should, it needs some TLC. If you have a large family and you are a heavy user, some yearly maintenance can help the unit last longer. It’s simple doesn’t take long and can extend the life of your dishwasher. Disconnect your dishwasher from its electrical source first. Clean out the filter and the well it fits in with a brush and (lightly) soapy water. Find the spray holes in the spinning arm and brush any calcification and debris off them. Check dish racks for peeling coating and evidence of rust. Replace or order some liquid rubber to cover the bare metal. Check the door seal for wear, cracks or missing sections. If you are experiencing problems with your dishwasher, our team of friendly, qualified, and professional plumbing technicians can help you solve it fast, from repairs and maintenance to replacement with a quality unit that will perform. We arrive on time, are respectful of your home and time, and are proud to be known as a trusted and professional plumbing repair team in the Bay Area. How Do I Lower My Sewage and Water Bill?